For various reasons, I’ve neglected this blog lately (one reason is my other website, Kickass Canadians). But I’m thrilled to return to it for The Cobblestone Corridor. When writer/director Erik C. Bloomquist asked me to review his latest short film, it reminded me of the direction I want to steer this blog towards: interviewing filmmakers (Winter’s Tale, Northword, Take This Waltz and Barney’s Version), taking requests from indie directors to help promote their work (Wanderweg), and doing joint reviews with pals—and of course my amazing nephews (The Lego Movie, The Hunger Games: Catching Fire, Outland). So here are my thoughts on The Cobblestone Corridor: I’m very impressed. The 25-minute movie is a tribute to film noir and old-school detective flicks. It tracks Allan Archer (Bloomquist), editor-in-chief for the newspaper at Alfred Pierce Preparatory School, in hot pursuit of his biggest case yet: investigating the dubious dismissal of Dr. Peter Carroll, chairman of the English department. Mannerisms and catchphrases aside (gumshoe, dame), The Cobblestone Corridor’s world is very much rooted in modern-day America. In the realm of prep school newspaper nerds (self-described! ), that means going head-to-head with a public that prefers insta-news and chat rooms to well researched articles and educated commentary. The film takes pains to argue in favour of traditional journalism (although the Internet ultimately proves handy in solving a certain case…). It’s an interesting exploration, one that is particularly at home in a film that so lovingly embraces the traditions and past conventions of another form of media—cinema. The Cobblestone Corridor has its tongue firmly planted against its cheek. Case in point, Allan’s deadpan response to a suspect who calls him four eyes: “I wear contacts now.” (The nerd of noir may have ditched his glasses, but he’s still looking through a similar lens.) Yet what brings the film home is how fully the characters, and actors, commit. They’re utterly earnest about the plot twists and developments, and the result is a charming, absorbing 25 minutes of classically contemporary storytelling. 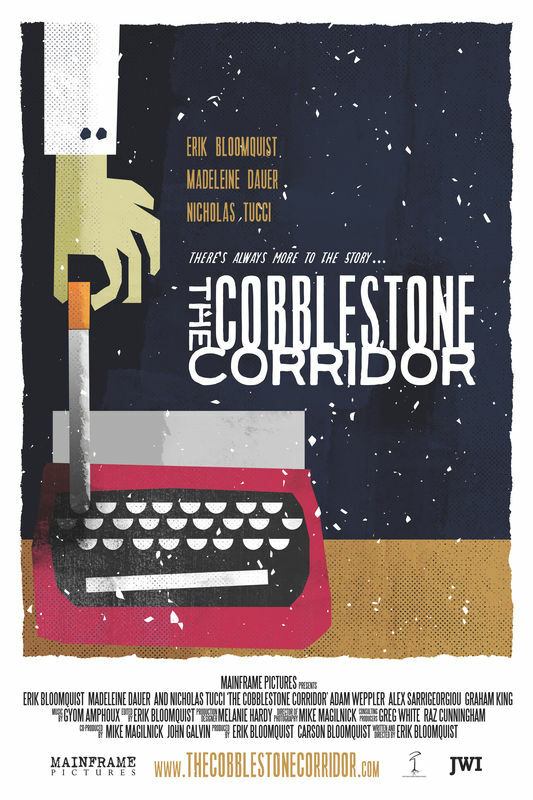 The Cobblestone Corridor is a slick movie, with great cinematography and production design, and solid performances across the board. Kudos to the entire team. Bloomquist in particular makes a strong impression, doing quadruple duty as writer, producer, director and star. He’s also clearly committed to getting the word out about his film; this blog can’t have a very high profile, yet he came across my Canadian site while reaching out to bloggers to promote his American film. Dedicated, hard working and talented—seems safe to say Bloomquist is going places. Visit his website to learn more. The Cobblestone Corridor is available to rent or buy through Vimeo on Demand. The price is low, the quality high. I hope you’ll check it out. Thanks to Erik for sending me the press kit and inviting me to comment on his work. He has inspired me, renewed my excitement for indie filmmaking, and reminded me of the power of believing in your ideas and seeing them through.